That’s right folks. My husband spotted it this morning. Scarlett O’Hara is pregnant again!! I wondered. She climbed back down into the tank this morning after almost 3 days up on top of the water filter. Just like last time – spend a few day on top of the water filter, next thing you know, she’s got a bunch of eggs on her abdomen. I am wondering if there is something about the water filter, maybe the flow of the water up through it as she sits in the currents, that helps the eggs come out onto her abdomen? 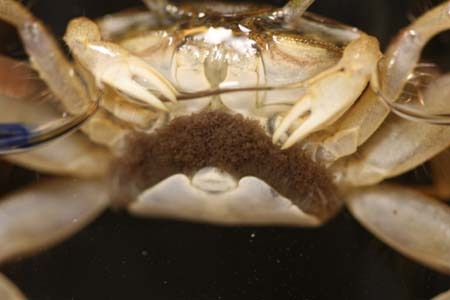 Does this replicate something about water currents in nature when fiddler crabs “bring out” their eggs? In any event, knowing that the last time she hung around on the water filter, she was pregnant, we had been watching her closely these last 3 days. She did NOT have any eggs showing Friday, Saturday or Sunday, but there they are on Monday morning. So we call this day #1 of “Pregnancy, Take 2.” I figured we’ve got about two weeks before she’ll drop the babies again. I’d like that nursery tank to have a full week to just run and establish itself before I move her over to it. Parameters in the nursery tank are good: No chlorine, nitrites, or nitrates. pH is about 8.0, water hardness >300, and alkalinity is running about 200 today. I need to bring the salinity down a bit more. It’s currently at 1.016, and if I can get it to 1.012 before I move Scarlett, that would be great. I don’t want to “shock” her with too big a salinity jump from her current tank to the nursery. The Post – Odd Goings-On in the Fiddler Tank – Is Scarlett Acting Pregnant Again? When I first I walked by the fiddler tank yesterday morning, I was sleepy and oblivious. Then I did a double-take. Sitting at the front of the tank was the discarded molted shell of somebody. On closer examination, and with my husband’s consultation too, we both agreed it was Melanie Hamilton’s discard. That means she is at the moment most likely to get pregnant if Admiral Byrd invites her in. At the same time we noticed that Scarlett O’Hara was sitting on top of the water filter….again. The last time she did that, we noticed shortly afterward that she was pregnant. Admiral Byrd of course, was marching up and down the tank, claw arm held high, and waving. To continue – Scarlett O’Hara spent the entire day and evening yesterday, on top of the water filter. She is still there this morning. She has never done that before or since, except when she was pregnant. I know she is still alive because she is “blowing bubbles.” Crabs foam sometimes when they’re out of water, to moisten their gills. Even when I freaked out Admiral Byrd yesterday, and scared Melanie Hamilton out of her live rock because I was cleaning the tank and accidentally bumped the live rock, Scarlett O’Hara didn’t leave the filter perch. She just moved down into the filter for a bit, then climbed back up. Admiral Byrd meanwhile kept trying to climb the heater power cord up to the top of the filter to be near her, but he couldn’t quite do it with that large claw. Yesterday afternoon we noticed that Melanie Hamilton remained outside the live rock, sitting there on the gravel serenely watching Admiral Byrd flex his claw. Then she spent the rest of the afternoon and evening in his cave lair. This morning she was resting just outside his lair, picking algae off the rock. He was napping inside. With any luck, we can try the larvae thing again somtime soon? I am in the middle of re-establishing the nursery tank. I had emptied everything from the original set-up, cleaned out the tank, put down the one inch or so of the calcium-releasing sand, and added the water. Now I did forget to rinse the sand out, so the tank water was cloudy at first, but it has settle out by now. I’m not sure how one effectively rinses sand out anyway without half of it going down the drain. I will say the white sand really makes the inside of the tank bright when the light is on. If we get babies again, it should be much easier to see them in such a bright tank. I couldn’t decide whether to make the 3 gallons of water I added marine or brackish. I guess I should start brackish because first we’ll have to move the mom, whichever one of them it is, from their tank, which is brackish into this one. I wouldn’t want to shock them. Right now the tank is on the “marine side” of brackish. I’ll adjust the salinity with a bit more water shortly. The live rock is back in the tank hopefully doing its thing to establish the nitrogen cycle. Both the air filter AND the bubbler are running and so hopefullly the tank environment will establish itself as quickly as possible. Rather than replace the old water filter cartridge and lose whatever nitrogen-fixing bacteria that had started to thrive in it, I left everything in place and returned it to the tank. An interesting about the old water in that tank. I tested it before I emptied it out just to see if the nitrite levels ever came down. They read zero, and the nitrates were in the “okay” zone. I guess once I stopped using the live phytoplankton and let the water filter run for a few days, that was what it needed. So the phytoplankton was most likely the culprit in the high nitrites. In any event, I dumped the old water and just started with fresh sea/brackish water all over again. One thing – that Reef Calcium product that I’d hoped would raise the alkalinity but not raise the pH, when added to half strength Instant Ocean… maybe it didn’t raise the pH but it didn’t solve the problem of the pH being too high from the Instant Ocean even when I used that at half strength. So I still had to use a pH lowering solution and this morning it is about 8.0 vs 8.4 that it was yesterday. So that’s perfect . At least though, the Reef Calcium did raise the alkalinity. I will keep you all posted on any news from the adult tank. Keeping good thoughts for a new crop of larvae babies. Stay tuned. 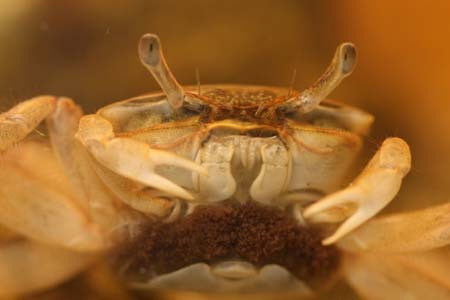 If you want to see a good picture of a pregnant female fiddler crab, here’s a picture from the Carolina Coastal Discovery Marine Education Program. This is about what Scarlett O’Hara looks like. If you want to learn more about the education program just click on the Carolina Coastal link above. So you’re like me and you’ve got a pregnant female fiddler crab. Now what? The dilemma now is did I wait too long to get it set up and get the “nitrogen cycle” started before she releases the babies? I can take a patch of the filter gauze from my current tank, which is loaded with nitrogen-fixing bacteria, and put it in the new filter to “seed it” with bacteria. Tomorrow I’m going to Fish Pros in Raleigh NC to get another good-sized chunk of live rock. Between the filter seeding and the live rock, that should get the water parameters in the safe zone and the bacteria up and running quickly. Also the live rock will provide calcium for the many molts the little ones will need to go through. What I was not sure though was how I would be able to “catch” the babies since I won’t know when she releases them and I won’t know if they’ll be too small to see once she does. Also, should I make the second tank a regular “salt-water” tank to represent the “open ocean” like most fiddler babies go to, or make it brackish like what they’ll end up in? This last question got further complicated by the information I found on the blog below that indicates I should isolate mom before she releases the young. So I have much to ponder tonight while I get this up and running. 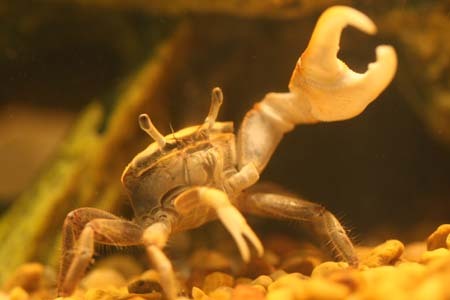 I did a search for info on pregnant fiddler crabs and come up with The “Dear Blue Lobster” blog entry” from July 25, 2007. The Dear Blue Lobster site claims to have been answering “your crustacean questions since 2002.” This entry is from someone who is concerned that her fiddlers make have “hooked up” and now what should she do? She is freaking out at the prospect of a 100,000 babies in her tank. 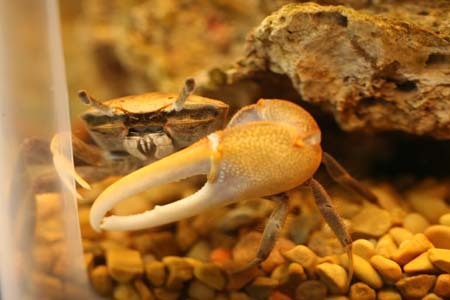 Since it is well past July 2007….I wonder how the mom (human) and the mom (fiddler crab) made out with their situation? For myself, we shall see. I am off to set up the tank. I guess I’ll set it up brackish and isolate mom before she “delivers.” I have also emailed Dear Blue Lobster for help on what I should do. I’ll keep you posted on his reply. Christopher Chimwich received his MMN in 2000, specializing in decapod behavior. He is currently surveying benthic decapod populations in the Indian Ocean for his doctoral thesis. Chris answers questions about crustaceans, covering everything from DNA mutation in African crayfish to Fiddler crab sign language. 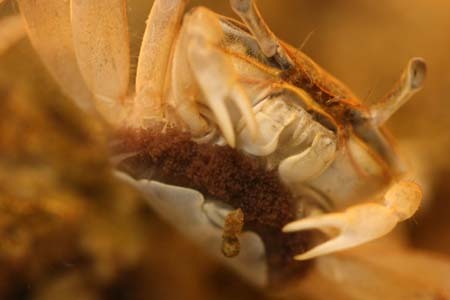 By the way, if you want to be a real geek, apparently the term for my fiddler crab when they have the brownish eggs attached to their abdomen is being “in berry.” So. 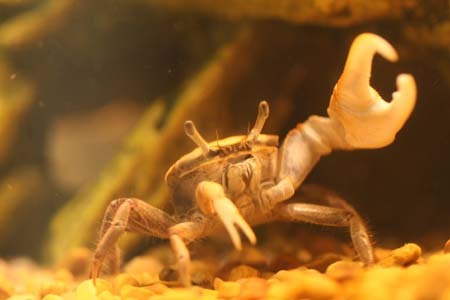 If you want to know what he has to say about fiddler crab sign language, click here.